Seymour Lake Park Oxford – review, info, and pics for Seymour Lake Park in Oxford Twp MI. 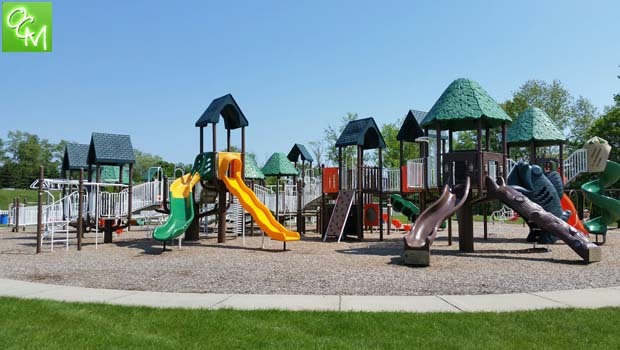 The 125 acre park features a splashpad, giant playscape, disc golf course, sled hill, full-size basketball court, 4 tennis courts, ball fields, and more… Seymour Lake Park is maintained by the Oxford Twp Parks and Recreation Department. Seymour Lake Park is a sprawling complex with plenty of parking at each of the park’s many features. Convenient dirt paths snake through complex leading you to each destination. The star of the Seymour Lake Park show is the giant playground – Kids Kingdom and the KLR Splashpad. Kids Kingdom is a Medieval-themed playscape / playground that is fenced-in and comes complete with a draw bridge entrance and modern indoor restrooms for “Princes” & “Princesses”. As the pics show, Kids Kingdom is very clean and impressive – a definite top 3 when it comes to playgrounds and playscapes in Oakland County! I certainly appreciate how the entire “kingdom” is self-contained making it a breeze to keep an eye the kids. Kids Kingdom playground at Seymour Lake Park was built in 2003 but it’s so well take care of that you’ll swear it was just unveiled. KLR Splashpad is a short (and safe) walk from Kids Kingdom. After sweaty fun on the big playground, Seymour Lake Park Splashpad (KLR Splashpad) is guaranteed to cool the kids off. The splash pad is self-contained and, like Kids Kingdom, very well-maintained. Shaded benches dot the perimeter inside KLR and kids will have a blast playing with the water geysers, water guns, spraying palm trees, and other fun inside KLR. Seymour Lake Park Splash Pad Review. Seymour Lake Park is used for Oxford Twp Parks and Rec sports leagues and other local sports leagues. There are plenty of full-size baseball fields, mini soccer fields, full-size soccer fields, and plenty of open space throughout the complex. The tennis courts are in dire need of repair but the full-sized basketball court looks immaculate and durable. There are two sand volleyball courts located in the middle of the park. Seymour Lake Park Oxford. is open year-round and they have a nice sled-hill called the “Red Flyer Run” (REVIEW, PICS AND VIDEO). When the snow melts, the centrally located sled hill instantly transforms for the perfect beginner spot for the Seymour Lake Park Disc Golf Course. This is an 18-hole frisbee disc golf course that is large and very scenic. See related posts for more activities at Seymour Lake Park Oxford.